Clary Fray is still searching for a cure for her mother’s magical coma. She meets Madeleine, an old friend of her mother. Madeleine states that she knows how to wake Clary’s mom up. Clary, Madeleine, Jace, Simon, Magnus, and the Lightwoods meet up at the institute, where Magnus open a portal to Alicante. However, they are attacked by Forsaken and Madeleine is killed. Clary arrives at the institute, finding it deserted, Magnus explaining what happened. Clary opens a portal and goes through. Luke attempts to stop her, but ends up going with her. Since they did not have permission to use a portal, they land outside of Alicante in Lake Lyn. The water from the lake is poisonous and Clary starts hallucinating and passes out. Luke brings her to Amatis’s home and the others are introduced to Sebastian and Aline, the Penhallows. Amatis is his sister and she nurses Clary back to health. Simon is imprisoned by the Clave, who want him to lie and and say that the Lightwoods are spies for Valentine. Clary sneaks out of the house and finds Jace. Sebastian walks Clary back to the house. Amatis is mad with her, but cools down. Clary goes to see Ragnor, a warlock, but finds Magnus. He says he need the white book to wake Clary’s mom up. Clary and Jace go to find it at the Wayland Manor. They get the book and arrive back to the city to find it infested with demons. They fight them off and arrive at the Hall. They give the book to Magnus. Clary creates a new rune. It allows Shadowhunters to gain Downworlder abilities. Valentine releases an army of demons on the city, but is stopped when he is killed by the Angel Raziel. When I started this book, I knew it was going to be an interesting book. 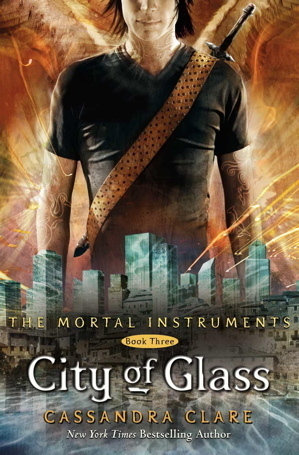 This book is the third installment in the Mortal Instruments series. This book is written in the third person point of view of the two main characters, Jace and Clary Morgenstern. Both of the main characters were introduced in the first book and have grown more mature and stronger since then. They both discover that they have angel blood in them, giving them special abilities. The best part of the book is when Sebastian fight against Clary, Jace, Alec, and Isabelle and wins. Sebastian is much faster and overpowers the three. This book has a decent amount of complicated vocabulary, but is not hard to read. This book is best suited for children from the ages of eleven to thirteen. By the contents of the book, I would rate this book nine stars out of ten stars. 1. Who had information on Clary’s mother? 1a. Madeline had information on Clary’s mother. 2. How did Clary get into Alicante? 2a. She used a portal she made. 3. Who is put in prison in Alicante on suspicion of being a vampire? 3a. Simon is put in prison. 4. Who is Clary and Sebastian looking for? 4a. They are looking for Ragnor Fell. 5. Instead of finding Ragnor Fell, who do they find at his house? 5a. They find Magnus Bane instead of Ragnor Fell. 6. Where is the Book of White located? 6a. It was located in the Wayland Manor. 7. What do Clary and Jace find in the cellar of the Wayland Manor? 7a. They find an angel. 8. What happens to the manor when the angel dies? 9. How are the wards of Alicante taken down? 9a. By painting demon blood on them. 10. Who does Sebastian work for? 10a. He works for Valentine. 11. Who is Jace’s real, biological father? 11a. Stephen Herondale is Jace’s father. 12. What is Sebastian’s real name and who is his father? 12a. His real name is Jonathan Christopher Morgenstern and his father is Valentine. 13. What does Clary’s alliance rune do? 13a. It binds a Shadowhunter and Downworlder together, granting the Shadowhunter the Downworlder’s ability. 14. What three items are needed to summon the Angel Raziel? 14a. The Mortal Sword, Mortal Cup, and Mortal Mirror. 15. Which race of Downworlders originally refused to fight alongside the Clave?